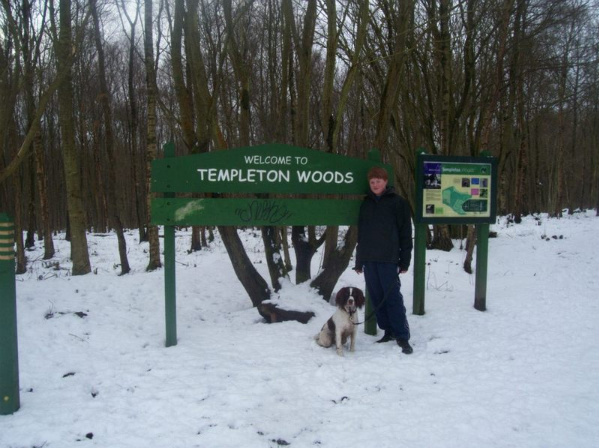 Ryan Liddell from Dundee has raised an amazing £114 for Oldies Club by undertaking a sponsored walk through three woodland trails taking him three hours to complete. This was no mean feat, just look at that snow! Luckily for Ryan, his faithful dog Gem was there to lend a paw. Well done Ryan, it’s a brilliant achievement and we’re all very proud of you! Olive Armstrong, our Regional Co-ordinator for the Northumberland, Durham and Tyne & Wear area, has raised a massive £438 by holding a cake and book sale combined with a raffle at her workplace. 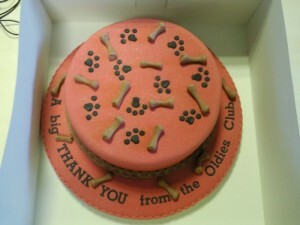 The top prize for the raffle was a very elegant and brilliantly decorated cake, donated by one of Olive’s very talented colleagues. Thank you to Olive and her very supportive colleagues! Four Paws Animal Rescue Fun Dog Show was a great success for Oldies Club due to the commitment and efforts of our lovely Amy, her very helpful Mum and special little man, Louie. Thank you to all of you for support! Chris and Dave Shilvock held a Bring & Buy Sale at their home in Manchester and raised the fantastic sum of Â£100 for Oldies Club. We’re delighted to have such willing and keen supporters. Thank you Chris and Dave! One of our wonderful supporters, Pat Kelly, has organised a raffle to help Oldies Club and Rochdale Dog Rescue – thank you Pat! The raffle was drawn on 6th August at Witney Farm Shop, Oxfordshire. First prize was a day at Ascot for a family of four and there were 25 other prizes, including Body Shop products, whiskey, gin, wine and loads of other stuff. 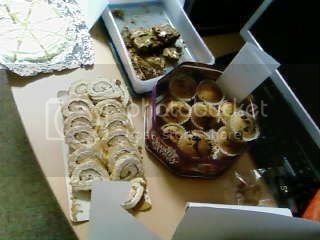 Oldies Club supporter Catherine organised a Cake Bake in July at her workplace, raising over £75 for Oldies Club – thanks Catherine! :) If you would like to organise a Cake Bake, coffee morning etc. please contact Oldies Club. 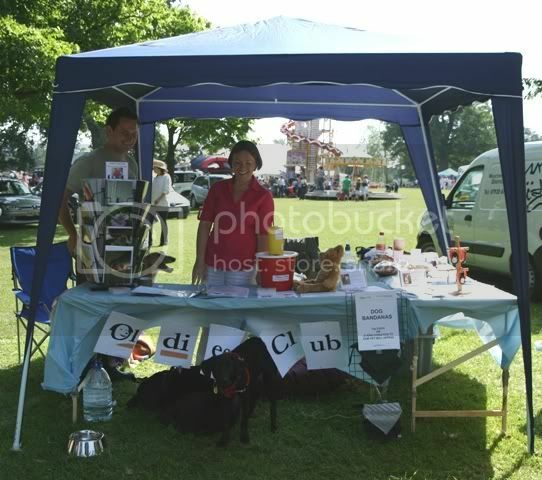 Oldies Club supporters Sandi and Graham did a fantastic job of managing the Oldies Club stand at the show this year. It was a fun day and raised £327 for our vet fund, which is desperately needed at the moment. Thank you so much to both Sandi and Graham for their huge efforts and willingness to get involved. You’re a fantastic help to us! 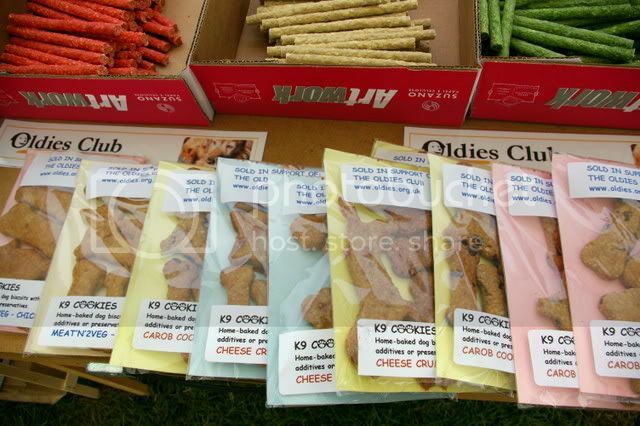 Special thanks to one of our supporters, Suzie Scott, for making some of her lovely homemade dog biscuits for us to sell on our stands at the Nadder Valley Dog Show and the Cold Wet Nose Show. The biscuits went like wild fire and people even came back for more on the day! Look how professional they are…! 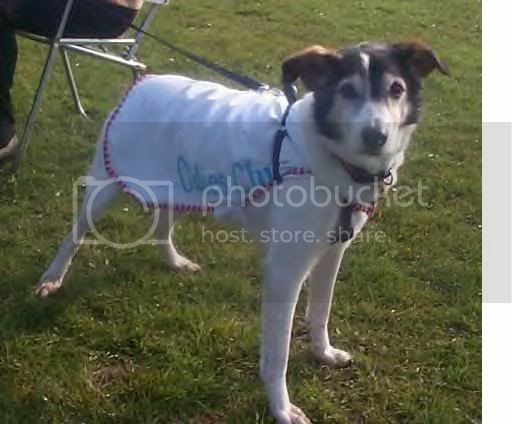 Oldies Club attended the Bowood Dog Show in June 2008 in Wiltshire, raising some much needed funds and promoting the oldies in need of a good home. Thanks to Bowood and Macmillan for the opportunity to attend. Thank you to all of our supporters who came on our camping weekend in the Cotswolds/Oxfordshire border. We had a very enjoyable and fun packed weekend, with plenty of socialising for the dogs and some pretty coloured cocktails for their human companions! The campsite was very good to us and arranged for everyone with Oldies Club to be close together. The site was very clean and the amenities were excellent for dogs, children and adults alike. Thank you to Cotswold View Caravan and Camping Park in Charlbury for having us! Here at the Oldies Club, we’re anxious to raise awareness for our hardworking organisation. We want to raise funds to help save the lives of more needy oldies each month and – most of all – we want to get our oldie dogs out there to meet the public, and maybe the special someone to give them that much-needed new home! 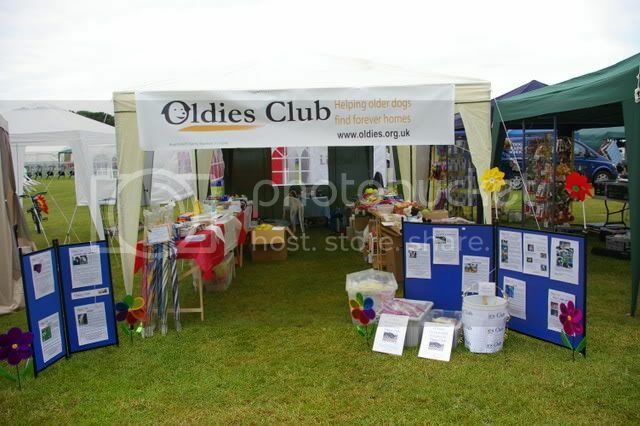 So, throughout the year, you can find the Oldies Club at charity open days, car boot sales, fetes, fairs, county shows and more. Sometimes, we’ll have goods to sell, including the range of Oldies Club merchandise, t-shirts, mugs and doggy goodies, and sometimes we’ll just be there to talk about our work with oldies across the UK and Ireland but – wherever we are – there’s always a bevy of dogs not far behind! 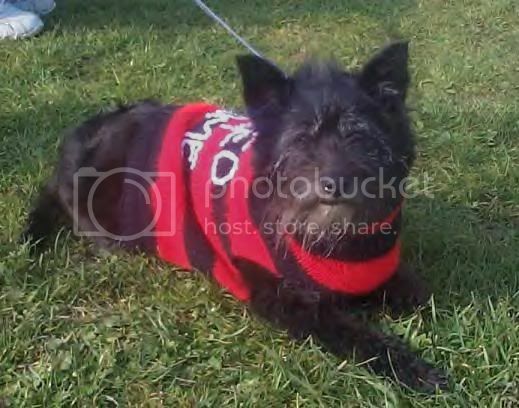 …or perhaps one of our famous hand-knitted ‘I Need a Home’ jumpers, like little Mitzi, who missed the vet’s needle by only an hour in an Irish pound. 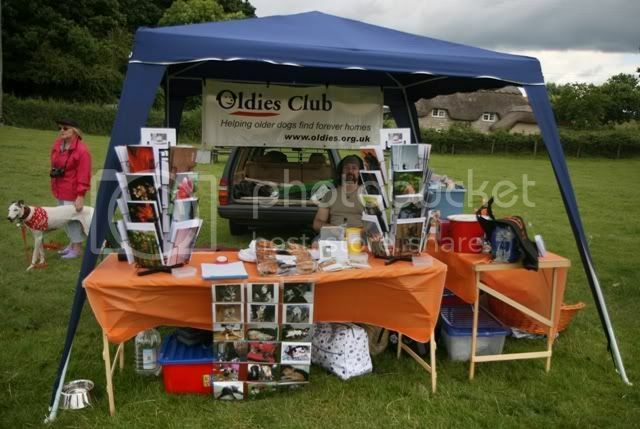 The Oldies Club has supporters all over the UK, so the chances are that we’ll be appearing at an event near you. Why not take a look at our Events Calendar, and come along to meet the dogs – and maybe even the volunteers! Can’t make it to our events? If you can’t make it to any of our events, you can still help us by Making a donation.